Why oh why do women lose their waists and become “apples” instead or “pears” with the approach of the menopause? Dr Yehudi Gordon explains and looks at the connection between nutrition and hormones. Nutrition, of course, being something of great interest to me. The truth is that emotions play a large part in how and why we eat. Women have a lot to deal with in terms of relationships, children and work at this stage of their lives. Hormones make it all so much worse. The best thing you can do for yourself is to eat in a way that optimises not only your weight but your health. This is exactly what my book The In-Sync Diet (written with nutritionist Fleur Borrelli) is designed to do and would advise checking it out. Whilst I agree with much of Dr Gordons’ nutritional advice, there are some subtle differences in my book which is based on the most up to date information and thinking. And do remember when you are reading the article that vegetables are carbohydrates and are preferable to grains. Here I will explain and clarify why bio-identical hormone therapy (BHRT) will be less successful if the nutritional environment of the body is ignored or abused. BHRT and nutrition are partners in helping the body age gracefully, preventing many of the most common symptoms and conditions that are associated with getting older e.g. hot flushes, muscle weakness, memory and cognition depletion, headaches, anxiety, depression and anger, joint pains and many more. ‘But I eat healthily’, they say! The term ‘healthy eating’ is over-used and misunderstood. Today, healthy eating means different things to different people. For some people it means eating the right quantity from all the food groups. For others it means cutting out sugar and fizzy drinks. Increasingly, it means avoiding gluten and cutting out red meat. But what is ‘the right quantity’? What about hidden sugars that secrete themselves in most bought food from bread to sauces? Is red meat the culprit or is it the size or frequency of eating it? The examples are endless. The term ‘nutrition’ means something else. Nutrition is the science that interprets the interaction of nutrients and other substances in food (e.g. phytonutrients, tannins, vitamins, minerals, proteins and fats) in relation to the maintenance, growth, repair and recovery, reproduction, health and disease of an organism. In today’s supermarket world, where fresh papaya is available all year round, grapes are flown in from Chile and apples and vegetables are perfectly shaped and beautiful to look at, we are unaware of how many nutrients have been lost en route. We don’t know the soil conditions in which the crops were grown, we have no idea whether the chicken on offer was fed hormones, whether or not the food labelling hides sugar or gluten and so on. This is not our fault – it is the fault of the food industry and its drive for profit. As we age the balance of hormones changes and production diminishes. Hormones are essential for the normal functioning of your body. If the amount produced drops or the balance between the various hormones alters, the body does not function well. Furthermore, every cell in your body requires nutrients (oxygen, water and vitamins and minerals, essential fats and proteins). Cells also contain specific receptors that are stimulated by individual hormones. Cells function best when the hormonal and nutritional environment is balanced. Beginning in the 30’s, sometimes earlier, hormones associated with ‘baby making activity’ may start to slow down. Over the next decades there will be a natural change in hormone balance as progesterone reduces, oestrogen effects weaken and testosterone reduces (but becomes more dominant). This leads to a wide variety of symptoms and medically recognized conditions. One of the consequences of hormonal reduction or imbalance is weight gain, especially around the middle for women. It is common to change to apple-shape whilst eating in the same way as one always has. Many women begin decades of dieting at this point – food limiting diets, diets deficient in nutrients or diets that aggravate adrenal activity compounded by stress and anxiety. Hormonal imbalance and nutrient deficiencies also contribute to symptoms and disease (such as osteoporosis, heart attacks and stroke, even cancer) well into the seventies and beyond. If keeping slim and healthy were as simple as achieving nutritional balance there would be no eating problems in the world. But unfortunately, there is a very close connection between your emotional state of mind and how this affects your body especially in terms of what you choose to put into it. Some people, starve themselves whilst others comfort eat. Some over-exercise in an attempt to compensate for food choices (often perceptually rather than actually ‘bad’), whilst others yo-yo diet falling prey to the latest diet fad. This leads to a negative and punishing cycle where particular foods or times/ways of eating are seen to be ‘good’ or ‘bad’ and do not necessarily nourish the body in the nutritional sense of the word. Nourishment is to do with food, of course, but it is also to do with other aspects of life including work and relationships. Changes in hormone balance have a significant influence on feelings of self worth, mood, anxiety and irritability. Improvements in hormone balance go a long way to reduce these symptoms, aided and abetted by a balanced intake of food and nutrients. The peri-menopause and the menopause itself (defined as when menstruation stops) is an important emotional transition in every woman’s life. It coincides frequently with children leaving home, career changes, altered work schedules, relationship re-evaluation and many more life decisions. If there are underlying emotional issues in your life – past, present or future – then advice and help from a therapist may make it easier for you to begin a strategy and plan to achieve hormonal and nutritional balance. It is never too late to begin to repair. What can you do about food? In addition to beginning BHRT treatment if blood levels and symptoms so indicate, there are six things you can do in relation to the food choices you make? Eat natural organic un-processed foods. The foods that you eat contain nutrients that help drive your metabolism – energy production, tissue repair, making hormones, producing brain chemicals and messengers. The nutrients in a plant food are dependent upon the soil and water they are grown in. The nutrients in animal foods are dependent on how they live and the food they eat. Many factories and processing operations strip out the fibre and nutrients from the foods that we eat. We will also ingest any chemicals or medication that a plant or an animal has been subjected to. Many of these compounds put greater stress on our detoxification systems. There is now evidence to suggest that some pesticides contain endocrine disrupting compounds that either stimulate or block receptors for hormonal action in the body. Using plastics for storage and wrapping food adds harmful chemicals. Without adequate nutrients you may not operate at your functional best. Macro-nutrition involves the three main food groups – protein, carbohydrate and fats. Protein is used for both cell repair and instructions; carbohydrates are the main source of energy and fats are used for energy storage, insulation, cell wall structure, and hormone production. These three macro-nutrients need to be proportionally balanced in a meal. A simple way to understand this is to look at your own hand. The little finger shows the quantity of fat. Protein and fibre from natural organic food are the essential components of meals and snacks. When you eat carbohydrates your digestive tract will produce enzymes that break it down until it goes across your gut wall into the blood stream either as glucose or fructose (fruit sugar). If the carbohydrates you eat have had all the fibre taken out through refining or food processing the amount of glucose entering the blood stream will be rapid and at high levels. Although you use glucose for energy if the level in the blood is too high it can damage tissues and may cause diabetes and inflammation. If the carbohydrates in your diet are full of fibre (found in the skin, husk, stem or leaf of the plant), then glucose is released into the blood stream slowly. If you add protein it will slow down the release of glucose even more. Your adrenal glands are involved with getting you out of danger by producing adrenalin and cortisol. They produce oestrogen (oestrone) although this is much weaker than the oestrogen produced from your ovaries. As your ovarian production of oestrogen winds down the adrenals may compensate to some extent as long as they are not trying to get you out of “danger”. Balancing your blood sugar is one way of reducing the adrenal workload, because if cortisol production is in balance, more the adrenal has more capacity to make the necessary hormones for health (oestrogen, progesterone, testosterone, DHEA). If you go for a long period without eating this will also increase production of cortisol. When cortisol is out of balance there are many negative effects on the body including bone and collagen formation and a compromised immune system. Caffeine will stimulate adrenal activity. Caffeine is found in tea, coffee, chocolate and some fizzy drinks. There are a wide number of plant foods that contain molecules that have a mild oestrogenic effect. In other words they can gently trigger your oestrogen receptors, which may modify some of your hormonal symptoms. You may need to speak to a qualified nutritionist to help you incorporate them into your life with sensible and simple advice! As nutrient availability in food is so variable and depends on how it is has been grown or farmed, when it is harvested, how long it has been stored often in plastic, how it is prepared and eaten, you may find a basic supplement programme useful to take on daily basis. 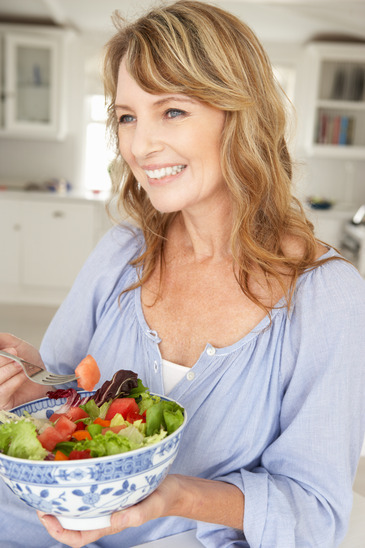 If you are experiencing symptoms of hormonal imbalance and have begun BHRT (or are considering it) then you may benefit from a nutritional consultation to advise you on how to make choices that will suit your life style and that of your family. I have just made an appointment to see my GP to discuss the possibilities of starting with the life changing hormones. Hi Glynis I would just like to say that I find the information in both your posts and your book invaluable. I have learned so much it has changed my lifestyle completely. I have never watched my Weight as I never needed to and apart from my weakness for cakes and chocolate I actually thought that I ate quite healthily! At 48 I had noticed I was getting a little plump around the middle and my hormones seem to be all over the place so I’ve received your good advice just in time!